Invested in college basketball or not - you still have to deal with the madness of March. 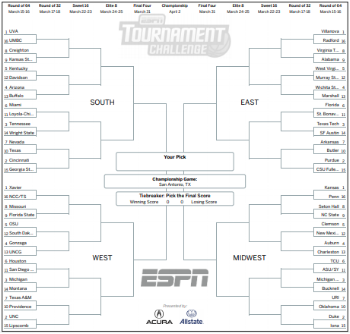 People all over the nation have been participating in bracket challenges since 1851 for a chess tournament in London, in 1877 for the Wimbledon tennis championship, and finally, bracket pools appeared in the 1970s when 32 teams competed in the American basketball NCAA tournament. Whether you're a student, a professional, or even former President Obama LINK—chances are you're filling out a bracket this year. There have been competitions, pools, and even celebrity grand-prizes in a competition to whoever gets their bracket the perfect bracket. The concept, popularity, and attraction to brackets come from the accelerating interactive experiences that engage gamblers, sports fans, and social communities all over the country. Aside from traditional commercials and advertisements (think: Super Bowl ads), competitive sporting events provide new touch points and modes of engagement for promoting your brand. Brackets can be used as multi-touch content campaigns that engage customers, attract new leads, and gain awareness for brands. Not all customers need to be die-hard college basketball fans either—extending to other target markets with different content can produce new access points for them. There have been multiple examples of brackets being made that have absolutely nothing to do with college basketball, giving those that aren't into the sport an opportunity to be (debatably) just as engaged as those keeping up with the games live. Brackets like Hair Brands, 80's vs 90's, or even breakfast cereals can be made into traffic driving brackets. A piece of content that has progressive steps to it, such as a bracket, has opportunities to connect other content to it as well. This specific form of content marketing is an asset that has a great potential for engagement, in addition to content views on top and below the bracket. Matt Beardmore, from Psychology Today, deciphered the different motivators for participating in such activity like March Madness brackets or Fantasy Football: the gambling motive or risk, the social interaction, the competition, and the entertainment/escape. Fostering a way for communities to bond will lead to better brand engagement. In partnership with Pepsi, Buffalo Wild Wings's involvement with Fantasy Football touches upon multiple audiences with potential to engage new users. The Fantasy Football Draft Kit enhances all of Beardmore's motivators for participation. Promotional items, or "swag," like the Fantasy Football Draft Kit shown here, related sales, and events are great ways to activities like March Madness and Fantasy Football to advertise your business.